To order, please call us at (877) 300-0087.
and provide a more exact shipping timeframe. based on the accessories you want. Ideal for Individual Use! Dimensions: 56"H x 30 "W x 55"L . Shipping Weight is 530 lbs. Why Choose An Arm-Style Pitching Machine? Hitting is all about timing. You must have the proper timing to know when to start your swing and when to shift your weight. This is achieved by watching the pitcher's arm and release of the ball. An arm-style pitching machine is the only type of pitching machine that gives you that same sense of timing. With each pitch you see the machine's arm wind up and release the ball. It is the realistic nature of the machine that allows you to practice the same fundamentals in the batting cages as you use on the field. 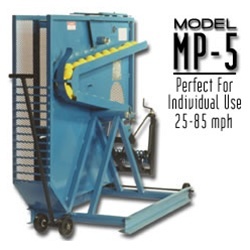 Because of this, the Iron Mike™ arm-style pitching machines from Master Pitching Machine are the favorite machines of professional players and coaches worldwide. 1 Year Warranty: All Iron Mike machine motors are covered under a 1-year manufacturer's warranty. Electronic circuit boards on the control system are warranted against component failure for 30 days after installation or a maximum of 60 days after shipment from the factory. The warranty on electronic circuit boards does not cover damage caused by severe electrical surges, electrical storms or accidental damage by servicing technicians. Specifically excluded from automatic warranty replacement are pitching hands, pitching arms, power cables, and power springs. Note on Shipping: Master Pitching Machine, Inc. will attempt to route shipments via the most economical carrier. Shipping charges are billed separately after the initial order. Have questions about Pitching Machines? Package Deal Savings! Let us know what accessories you want and we'll calculate your discount.